Scratching is one of them. They scratch to sharpen their claws, and to mark their territory. It is a powerful urge with many social implications for cats. Cats are, shall we say, more emotionally complex than dogs. Click here to go to The Indoor Cat Initiative, a website that discusses in detail the many needs of cats. There is some controversy both domestically and world-wide about whether it is ethically and morally right to declaw cats. 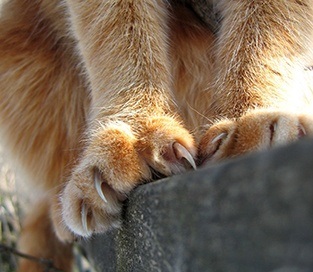 In many European countries, for instance, declawing is either not done or outright illegal. In America, most (but not all) veterinarians agree that when done properly, declawing can be a benefit to both the cat and the people involved. Without a doubt is is a painful procedure, and absolutely must be done in conjunction with excellent pain control. Declawing is best done when the cat is under 6 months of age. Young, immature cats declawed at less than 6 months of age heal fastest, experience the least pain, and have the lowest risk of complications. The older they get, the more painful the procedure is, the slower the recovery, and the more likely complications become. One year old is not ideal. 2 years old is less ideal. 3 years old will take some convincing to get me to do the surgery. I do a few cats aged 4 and 5 years, but I've only done maybe a handful over 6 or 7. If you are thinking of having your older cats declawed, schedule a consultation and we will discuss the pros and cons, the likely complications, and the costs. Generally, we remove all ten of the claws on the front paws. No matter how you spin it, it is hard to get away from the fact that it amounts to the amputation of the last joint of each digit. There are several surgical techniques in use. We use a technique at Sunnyside Veterinary Clinic that involves surgically removing the claws with a CO2 laser. We generally only remove the front claws. Occasionally we will consider removing the claws on all four feet, but there needs to be some compelling reason to do so. I find medical issues on the owner's part to be quite compelling. The laser is widely accepted by most veterinarians as the best way to perform this procedure. There are practitioners out there who are able to do the procedure well without the laser, but in my hands laser declaws are dramatically less painful than the older methods. That means that pain management is vital. At Sunnyside Veterinary Clinic, we use a balanced, multi-modal, pre-emptive pain management system that does a nice job of controlling post-op pain. Balanced means that we use low doses of several different medications in order to minimize side-effects and to increase efficacy. Multi-modal means that we use several different methods of providing pain control. The different modes of pain control act synergistically to provide more complete pain control than any one or two modes could provide. Pre-emptive means the pain medication is given before the painful stimulus. Pre-emptive pain management techniques were pioneered in human hospitals, and have been adapted for use in animals by progressive veterinary clinics. When pain medications are given this way, the pain response is greatly dampened. Click here to go to an in-depth review of pain management. The first is infection. Because the cats must walk around on their incision sites, infection can happen. We routinely give an injection of a long-acting antibiotic to minimize this possibility. The second is pain. Sometimes despite our best efforts at pain control, the patients will experience break-through pain. This is especially likely to happen in the older patients. When this happens, additional pain medications may be needed. The third is persistent pain. Rarely, some individuals will experience pain long after the post-op pain should have resolved. Occasionally, the pain will persist for life. We suspect that the cats feel phantom pain in their amputation sites, just as some human amputees feel phantom pain for years in limbs that are no longer there. We routinely use a medication called gabapentin for all our declaws, which helps reduce the chances of this happening. Another possibility is opening of the incision sites. Sometimes, because the patients walk around on the incision sites, they will not heal closed despite suturing. If this happens, a second procedure will be needed to close the incisions. The last complication is that very rarely, some cats will not be able to stand normally on their paws. The tendon structure never heals normally, leading to an abnormal posture. This can be permanent, and there may be nothing that can be done about it. Fortunately, it is quite rare. We feel that it is very important to do all that we can to make your cat's experience as pain-free as possible. We use a balanced, multi-modal, pre-emptive pain management protocol. Balanced means that we use low doses of several different medications in order to minimize side-effects and to increase efficacy, and multi-modal means that we use several different kinds of medications that act in different ways to attack pain from different directions. Step 1: A pre-op dose of gabapentin is given, as this has been shown to help reduce post-op pain in people. Step 2: The cats receive a pre-anesthetic injection of buprenorphine, an excellent long-acting pain drug for cats, combined with nalbuphine, a short-acting injectable pain medication. Depending on the cat's temperament and mood, sedatives may be added as well to control anxiety pre-op and to provide additional pain relief. Step 3: Anesthesia is induced with injectable IV drugs, and then the cat is placed on inhalation anesthetic. The injectable drugs are chosen to take advantage of their inherent pain control properties. The cat's blood pressure, heart rate, oxygen saturation, and expired CO2 levels are monitored. Step 4: Nerve blocks are done with local anesthetic. Step 5: The surgery is done with a CO2 laser. This instrument seals nerves and blood vessels to reduce bleeding and pain. Step 6: After recovery, buprenorphine pain medication is given orally, and continued for the next five or six days. To this we add gabapentin, another pain medication that works by a different mechanism and which is particularly effective on nerve and phantom pain. Depending on the cat's age, a third medication called Onsior, a coxib-class non-steroidal anti-inflammatory, may also used post-op. Older cats and cats with more than just the front claws removed may need more pain meds, sutures, or longer hospitalization, which will affect the cost and can add $25, $50, or even $100 to the fee. We will discuss that at the pre-surgical exam. If there are complications in cats under 6 months of age, we don't really expect that and will generally deal with them at a discounted fee. However, for the older cats, complications are not totally unexpected and while we will absolutely help you with them we will charge regular fees. Occasionally we are asked to declaw cats because of temperment reasons. This can pose problems in the case of complications even in the young cats under 6 months. What this means is that they may have to be sedated to be examined. You will also need to purchase a bag of Yesterday's News, a paper-based litter for use during recovery. We try very hard to be sensitive to things like owner's medical needs, emotional needs, etc, but sometimes the risks just aren't worth the potential benefits. It's nothing personal, and there will be no charges for exams or consultations. We won't think you are a horrible person, either! It's OK for two different people to have two different opinions about a complex topic.